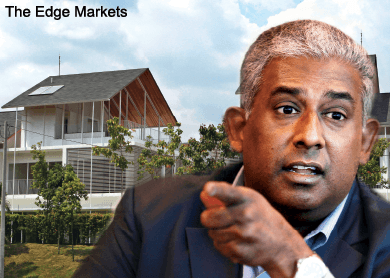 ONE THING that is unmistakable about Siva Shanker, the outgoing president of the Malaysian Institute of Estate Agents (MIEA), is his affable personality. Upon meeting him recently, Siva joked about his newly installed air conditioner in the MIEA office in Petaling Jaya. “I had an air conditioner installed right above my head. I love the cold,” he quips. But beneath his boisterous laughter and good-humoured exterior is a man on a serious mission. With his hectic two-year tenure coming to an end this month, Siva says all the efforts put in by MIEA in the past two years have been geared towards completing his work as president before handing over the task. His successor will be determined at the upcoming annual general meeting. “The annual general meeting is on April 25. Constitutionally, we are allowed [to hold the post] for up to two terms, but I am a believer in doing my best and then giving others a chance to do their part,” says Siva. Apart from efforts to eradicate illegal brokers and find ways to endure a slower property market, MIEA is trying hard to sustain its membership and continuity. “There is still a lack of empathy in the real estate profession. MIEA aims to change the attitude of agents and the public across the country. We hope to achieve that by reinventing the organisation and adding more services,” says Siva, who is also CEO of PPC International Sdn Bhd. These issues, however, have not stopped MIEA from achieving a certain level of success. It has 2,461 members, a number that has more than doubled since Siva started his tenure in April 2013. A key development in the past year was the organisation’s collaboration with The Board of Valuers, Appraisers and Estate Agents (BOVAEA), together with the Association of Valuers, Property Managers, Estate Agents and Property Consultants in the Private Sector of Malaysia and the Royal Institution of Surveyors Malaysia, to register negotiators, which has never been done before. The effort paid off as there are now 13,695 registered real estate negotiators. Registered estate negotiators (REN) are given identification tags to distinguish themselves from unscrupulous negotiators. Negotiators are required to attend a one-day course, which has since been extended to two days or 40 hours. “We wanted to improve the standard of the programme, so we decided to impose a new minimum entry level of 40-hour, two-day training to ensure that the participants are well-informed and are not misrepresenting the industry,” explains Siva. The two-day course came into effect on June 1, 2014, and has since attracted more than 11,000 participants. Siva stresses that there is still much to be done to eradicate illegal brokers. “Under the Valuers, Appraisers and Estate Agents Act 1981, it perceptibly states that unless one is a registered estate agent, one cannot transact property for a fee. The penalty is three years in jail or a RM300,000 fine, or both. Despite the existence of the Act, there is zero enforcement, and illegal brokers are unafraid to continue committing the crime as there is no risk of being incarcerated,” he says. “I believe there is still a lack of communication between the authorities, agencies and governing bodies. In Malaysia, thousands of unlisted negotiators are roaming free, and it’s ludicrous because there is a law. All we have to do is prosecute the illegal negotiators. Siva says the public needs to understand the intricacies of property transactions and negotiators. “People must know the difference between registered and non-registered agents, negotiators to prevent fraudulent property transactions. MIEA has launched a series of awareness campaign called “Is your real estate real?”, which consists of visual advertisements, appearances on radio shows such as BFM, newspaper advertisements and articles, and billboards. According to Siva, more than RM1 million has been allocated for the campaign, which emphasises the six key elements to identify the genuine tag of a registered negotiator— the colour red, the QR code, the name of the company, the REN’s name, the REN’s assigned number and hologram. “This year, we have allocated another RM500,000 for the campaign,” he says. This year, MIEA aims to increase its membership by encouraging the younger ones to register and educating the public on real estate professionalism. An important component is MIEA’s Real Estate Professional Seminars (REPS). “We have a separate department to handle the seminars. The REPS cover a wide range of topics such as how to get exclusive listings, how to sell oil palm estates, resort and hotel planning, ways to sell refineries and different sets of skills for different sections of the industry,” says Siva. “It is part of our continuous professional development (CPD) programme. If you are a registered negotiator, then you will have to renew your authority to practise every year, just like other professions such as law, medicine and architecture. You must collect 10 CPD points to renew your estate agent authority annually. There is, however, a change in the Professional Diploma in Estate Agency programme offered by MIEA. The organisation collaborated with Open University Malaysia (OUM) in 2012 to validate and award its diploma programme. However, MIEA will not renew the contract with OUM when it ends in September. Siva maintains that MIEA is strong enough to stand on its own. He notes that although the diploma programme will no longer have an endorsement from an institute of higher learning, its participants are more concerned about the programme being approved by BOVAEA and its standards not being compromised. “We shall proceed without OUM. We will run the diploma programme by ourselves, which we have been doing for the past two years. We took over the course from OUM, took over the operations, up to a point where it is only the diploma that is certified and validated by OUM. Apart from that, we have taken full charge of everything, especially the administrative side,” says Siva. MIEA is also focusing on the establishment of its secretariats in Penang, Johor and Sarawak. Recently, its headquarters in Kuala Lumpur acquired another office floor to accommodate 82 participants. According to Siva, MIEA’s Ipoh branch has also been revived. “We have been pushing for all the branches to be autonomous and we have seen success in many states. This is, by far, one of our proudest achievements, considering our humble beginnings,” he adds. One of MIEA’s latest initiatives is its youth division, MIEA Youth. Its formation was inspired by Siva’s vision for continuity in the real estate profession. Established last year, MIEA Youth has since attracted 322 under-40 budding estate agents and negotiators. One of its objectives is to bring the young negotiators together in the spirit of professionalism and networking. “The average age of MIEA members is increasing and it dawned on me that we are not doing the necessary to attract youth into real estate agency industry. So I decided to put together MIEA Youth,” says Siva. MIEA Youth programmes consist of three main categories — sports, social and professional development. Some of the programmes that have been successfully carried out include MIEA Youth Power Networking, Broga Hill hiking and MIEA interagency bowling tournament. “MIEA Youth will also have programmes tailored for the younger negotiators, such as special REPS with topics concerning the younger agents like how the internet and social media can be utilised in their work,” says Siva. The first MIEA Youth was launched in Sabah last year. This was followed by MIEA Youth Penang and MIEA Youth Johor in February and March 2015 respectively. “I’ve put my heart and soul into MIEA in the past two years, at the expense of my business, my social life and my Rotary Club participation. I look forward to returning to a normal life where I can go cycling with my children,” say Siva. This article first appeared in City & Country, The Edge Malaysia Weekly, on April 13 - 19, 2015.